What a day at the Tour de Yorkshire Sportive held on Sunday 3rd May 2015! There was a choice of 3 routes (55km, 109km & 142km) from which you could batter yourself. Later in the day, the Pros were racing on the majority of the same route into Roundhay Park, Leeds, at the end of Stage 3. People had come from all over the UK and beyond, I even rode up Pool Bank with a bunch of Americans on holiday. There were at least a dozen Clifton CC members who participated, having to cope with all the different elements thrown at them: rain, hail, cats ‘n’ dogs, kitchen sink and even some ‘shine’ towards the end. I had mixed feelings of excitement and apprehension as I drove to the event in pouring rain, the windscreen wipers flicking into double quick mode to cope with the torrential downpour. I was pleasantly surprised to arrive at the leisure centre in Leeds in good time and be expertly ushered into the parking area on the surrounding rugby fields – 6,000 cars belonging to 6,000 cyclists! Cars were filled with cyclists getting changed behind their steamed up windows, everyone leaving it to the last possible moment before facing up to the inevitable soaking. There was a certain gallows humour amongst everyone, one guy asking his mate whether he’d left a copy of his dental records with next of kin in case they needed to identify his body! The start was very well organised. After getting the starters orders via the loud hailer and all of us shouting in unison about how much fun we were having in the rain, we rode through the timing chips in a group of around 50. The descents were treacherous on the slippery, wet roads and there was a veritable smorgasbord of opportunities to ‘do a Ben Swift’. On the long climb up Pool Bank, I gave my one and only shout for the day to a fellow Clifton member. By this time, I’d latched onto a couple of strong groups of riders from both Otley and Ilkley who thankfully knew the local roads and passed on some tips in advance of some dangerous sections. It was unchartered territory for me through the ups and downs around Bingley before the first feed station at Cullingworth where we were treated to a convict’s feast of boiled potatoes and biscuits (oh, and jelly babies!). When I entered the event earlier in the year following a period of illness, I didn’t think I’d have the legs for the 88 mile long route so opted for the 68 mile medium route instead. This route cut off the bottom loop to Hebden Bridge. As it turned out, I did have the fitness but was quietly chuffed that I’d avoided having to do the extra 20 miles in the rain. A big well done and congratulations to the other Clifton Members who did do the long route! We picked up the long route again just before Haworth. The steep cobbled climb up through the quaint tea shops and cafes was used in the 2014 TdF Grand Depart and again was one of the highlights of the day. The crowds were gathering in the narrow cobbled lane and ‘lifted’ us up and over the steep hill. At the very start of this climb of about 400 metres, a female cyclist riding near me asked an old Yorkshireman on the side of the road how far it was to the top. He replied quick as a flash: “Keep going luv, only 30 metres to go, you’re almost there!” Made me laugh. More climbs followed before we arrived in a small village with a little stone bridge crossing. I had ridden quite hard in ignorant bliss to this point, following a nice selection of wheels. I turned the corner and was confronted by a 25% wall, the Cote de Goose Eye! The left hand side of the road was clogged with riders reduced to walking. The right side of the road contained riders doing wobbly ‘S’ shapes to cope with the gradient. It was actually quite tricky to navigate a path through the cycling traffic on the steep, narrow road. The brilliant thing was that the crowds at the top were giving huge support to any riders who were having a go at making it up the climb. People were literally shouting in my face, willing me up to the first hairpin. They gave me the necessary shot of adrenaline to get me successfully over the top – it was amazing the difference the crowd support makes. It was another mile or so before we arrived at the final summit. One guy in front of me leaned across to his mate and gave him the news that they were roughly half way through the ride – this news completely shattered his mate who had mistakenly convinced himself he was near the end of the ride! “Ya jorkin’! Ya jorkin’ aren’t ya! YA JORKIN! !” He almost fell off his bike in exasperation. The next group I latched onto took me at full tilt through Silsden to the next feed station at Addingham where we were subjected to a barrage of flapjacks. I was still feeling ok at this point, despite the incessant climbing. By now, the rain had finally stopped and the crowds were really starting to line the roadsides in readiness for the arrival of the Pros a bit later on. We were getting huge cheers at every corner as the police outriders were holding up traffic to let us sail through, despite it being an open road event - it really was an amazing feeling. In Ilkley, the crowds were starting to swell and my ignorance of the parcours continued. I chatted to another rider just outside of the town who said ‘he’d done a bit of racing’. We hit the beautiful , long climb up to the Cow & Calf and he proceeded to trash me. I’d forgotten the popular Yorkshire ditty: “On Ilkley Moor bah't 'at, Never climb the Cow & Calf, On the wheel of a 1st Cat”. Towards the top, the gradient ramps up from 10% to 17% at about the place where Ian Bibby started popping wheelies in the Pro race. (https://www.youtube.com/watch?v=I9sEwxWjH_I) Once again, the walkers filled the left side of the road and the cyclists who were having a go at summiting were literally willed over the top by the crowds. Given the number of times a Clifton club run had been to Bolton Abbey or Ilkley, I wondered why I’d never done the Cow & Calf. After some rolling hills, we arrived at the Chevin Pub. Someone said “ere we go again” – I looked up, “oh, up there you mean” - Slithering into the distant sky above was one long moving snake of coloured cycling jackets scaling the Cote de Chevin – an awesome sight! Once we crested the summit, I stupidly thought the hard stuff was over. We absolutely flew back down Pool Bank and innocently took a right turn at Arthington where I quickly pulled over to remove my rain cape as the clouds had started to disperse and the sun was starting to poke through. At this point, I thought I could really start to put the hammer down on the charge back to Leeds. I came across a sprint points sign and obviously expected to see a flat road ahead. “Hang on a sec, what are those people doing up there!” It was known locally as Black Hill, a 19 percenter! - used for sprint points! – only in Yorkshire. 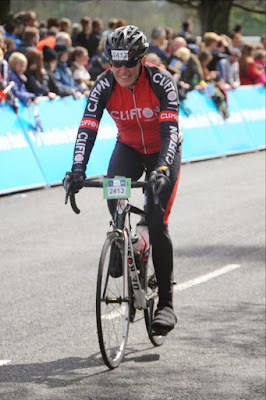 Just when I was starting to struggle a bit, a group of fans at the top went berserk at the sight of my Clifton jersey – they obviously knew the Club and their support helped me successfully through the tough section. We ticked off the 15km, 10km and 5km to go banners before hitting the uphill section of the Leeds outer ring road. Somehow I found myself on the front, which occurred to me would have been a strategic mistake in a Pro race, unless of course I was in charge of the lead out train! We turned right at the roundabout and swept down a descent under the flame rouge before turning right again into Roundhay Park. I’d learnt from previous experience to separate myself out of the group I was in to ensure I was well positioned for a great photo at the finish line. Plan A was to drop off the back and let the remainder of the group ride ahead. Then I saw the others had the same idea as me and the group started to slow down and splinter. I decided to activate Plan B and noticed there was a 250 metre gap up ahead, so I charged around the pack and drove hard into the gap. At this point, my opinion of the ride elevated from merely ‘sensational’ to a much higher level of something approaching Cycling Utopia. I could re-live the next minute or so forever in my cycling dreams, riding by myself down the final straight with hundreds of cycling fans bashing the hoardings in support – I felt like I’d died and ridden through the pearly gates of heaven on the big cycling club run in the sky. I did consider zipping up the jersey and throwing my arms in the air, but then imagined myself sprawled on the road in front of the huge crowd, so thought better of it and kept my hands on the bars. A groovy looking finisher’s medal was then shoved into my hand. The tough route was probably not ideal for complete novices. The roads needed to be cleared for the Pros’ race later on so there was no time to dilly dally. With all the climbing, I think any cycling newbies probably needed to have booked their broom wagon seat in advance. There were 4 categorised climbs on the Pros’ route but Chris Boardman said on TV that he’d counted 19 challenging climbs. To me it felt more like 356! Despite the early rain, this ride slotted straight into my Top 5 cycling rides of all time. My finishing time was quick-ish, mostly due to the tows I’d enjoyed throughout the ride which put me in the top 10% of times for the 68 mile route as well as for my age group. In an event with 6,000 cyclists en route, if you don’t like the pace of the wheel you’re following, just wait ten seconds and another will soon appear. It wasn’t about times though, it was about the exhilarating experience of pretending I was a pro rider for the day. The emotion conjured up by the crowd support on the climbs and through the villages was something to behold. I hope the other Clifton members enjoyed it as much as I did. If the organisers decide to repeat the show again next year, please do yourselves a big favour and sign up, it truly was a once in a lifetime experience.